Mailing Tubes with End Caps are the most popular style of shipping tube. They are typically made from 3-ply, spiral wound paper. Each end of the cardboard tube is sealed/closed with an end cap. These end caps not only keep the contents from falling out, but they also provide extra crush resistance. End caps are included. 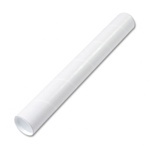 White Mailing Tube - 2" Diameter .060 Thick,manufactured by industry leading companies. High gloss three ply rigid spiral wound,dimensions listed are inside dimensions, first dimension is tube diameter, followed by tube length. End caps INCLUDED. White Mailing Tube - 3" Diameter .060 Thick,manufactured by industry leading companies. High gloss three ply rigid spiral wound,dimensions listed are inside dimensions, first dimension is tube diameter, followed by tube length. End caps INCLUDED.